Toy Story: Woody to Buzz: "You're a Child's Play Thing!!" My son playing with his toys. This is hillarious! This is real life -- appreciated here. Nice concept - the adult shoes in the background, the almost random crop and faceless model all very toy-storyish. The lighting isn't to bad. I think the composition could be a lot better. And the set could have been prepared with more thought as to what is in the frame and what isn't. Sorry Mate.. Don't think that shots as this would score very high..
You'll probrably be getting loads of 1s and 2s for not meeting the challange.. I'll keep way from that and will vote just on the technicals of the photo. 1) The cropping is a little off.. The cowboy on the left is off focus and cropped akwardly.. either leave him in the full picture or out of it..
2) The horizon is a little tilted.. don't know if it's intentional.. but it makes the photo look loop-sided..
3) If it's meant to be a snapshot, you might want to include the child in the photo. This would make the photo very pleasent to look at. I like the idea of interpreting the photo and the creative portray of the photo.. I'll score it a 4, but that's omiting the "meeting the challenge" element. Hope this helps.. Looking forward to your next entry.. :) cheers.. Very nice. What happened to the lions other foot!?! :) He is lucky, if he were a horse they would put him down. There are a couple of things that could have added to the photo. Of course these are all just my personal opinion and ultimately it's all about what you enjoy. The cropping seems a little tight. Woody being completely viewable and in focus would make him and Buzz the focus instead of Buzz and the lion. The fact that the lion is in the shot makes it feel more like a snapshot than a scene recreated from a movie. 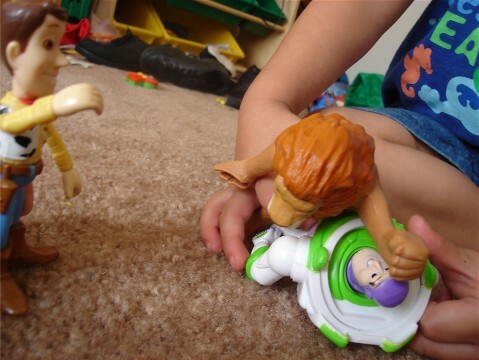 Although there have been many times I thought I would really enjoy a movie where Buzz gets mauled by a lion. If you glance through some of the other shots in the challenge then you will see a lot of them have setup very realistic recreations of a scene. While this shot is a very good photo it does feel more like a snapshot than a shot that was planned and setup. you should try and get all your shots up to the 640 pixel max allowable size, alot of the time the photos will be marked down ownly for this reasonand not even really judged for their merit towards the challnge. Take a look at this tutorial on this site. This photo could have been better if it were more neatly composed, with a clearer background. Proudly hosted by Sargasso Networks. Current Server Time: 04/26/2019 07:41:40 AM EDT.